Outlaw is a modern contract management solution that streamlines the contract lifecycle for organizations - from templated document generation to cloud-based redlining to real-time negotiation and eSigning. With transformative technology and a modern user interface, the platform helps users shorten contract cycles significantly, redline & negotiate with full visibility, and collaborate effectively. The software is developed by product experts and entrepreneurs with extensive experience in creating and signing contracts. With this, it empowers organizations in industries such as legal, financial services, education and real estate to work better and faster. At its core, Outlaw expedites the entire contract process with an efficient deal flow structure and functionalities such as smart variable drafting, redlining, version control and digital signing. Outlaw also supports seamless integrations to third-party tools like Box and Salesforce so users can do more with what they already have. 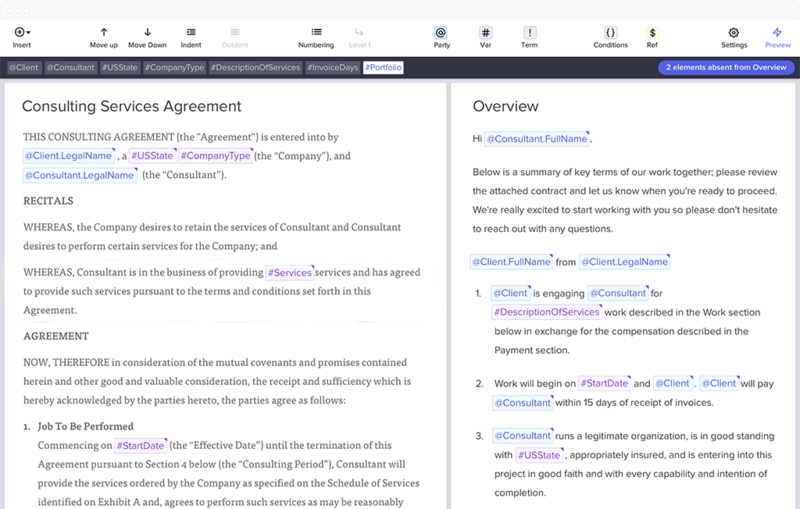 Users can generate error-free contracts easily from dynamic, pre-approved templates simply by filling in the blanks, saving them time in repetitive tasks. Outlaw’s efficient deal flow structure allows users to seamless move from contract creation to multi-party sharing and negotiation. Execution via e-signing then seamlessly completes the process, at which point the contract is securely stored and available for export to PDF. A simple overview in introducing your contract minimizes confusion. What sets Outlaw apart from other platforms is how it allows users to attach a customizable plain English overview layer on each contract sent out from the platform. Eliminating legal jargon ensures all parties can fully understand the contents of the contract without having to go through endless legalese. This, in turn, moves deals and agreements faster. Outlaw speeds up the negotiation process for users by eliminating tedious email or phone call back-and-forths with powerful redlining, threaded commenting and in-document editing functions. This ensures complete transparency and bulletproof resolution. Outlaw helps users improve visibility into their contract cycles with contract audit trails, bulletproof version control, and unique approval flows. This helps users enjoy peace of mind knowing all deal interactions are being tracked, thereby reducing risk and ensuring compliance. Outlaw eliminates share drives and disorganized storage systems. The platform provides a cloud-based centralized contract repository where users can store and manage their contracts. Since the contracts are stored in the cloud, they can easily be accessed anytime and anywhere according to Outlaw reviews. With this, users can also get a complete overview of their contract pipeline, where they can see at-a-glance, which stage their contracts are in.